Really, was there another option?! I went to collect this book the day it was released, I asked the man who served me in Waterstones how many he'd sold today and he said he'd lost count a long time ago! I'm not a massive Harry Potter fan - I've read all the books but I haven't read them again (other than the first thing when I was on a long haul flight), or remembered that much about them. I can't remember spells and please don't test me on characters and their relationships with other characters. However, I do love that they're such great stories. 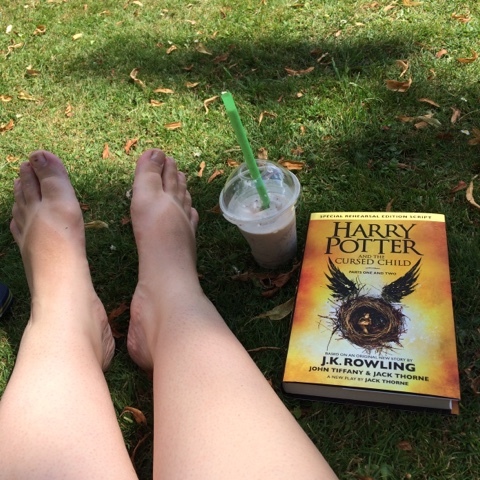 After I collected my copy I went to the local milkshake shop and redeemed my full loyalty card so I had a free drink, then I took this to the park and sat in the sun to drink it and read the first few pages. It is just like catching up with old friends. I think I am going to enjoy this! My book for July was #readwithoutprejudice. Oh my goodness, I loved this book. Loved it. 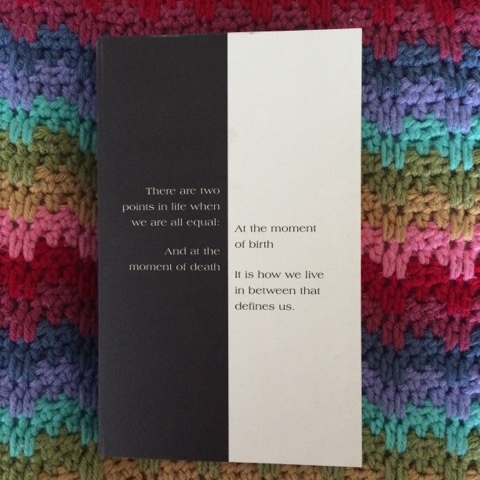 The book is due to be released in the autumn and ARCs are already available - some twits have posted photos of these ARCs (complete with author and title) using #readwithoutprejudice which obviously completely ruins the purpose of having a secret hashtag. I personally am not a fan of surprises, and did everything I could to find out the author (which to be fair, wasn't that hard) but I did that of my own accord, and I haven't told anyone else. The publishers have now revealed the author, so if you want to know it is quite easy to find out. However I won't say who it is here, just in case other people are still reading - and don't go looking at the hashtag! 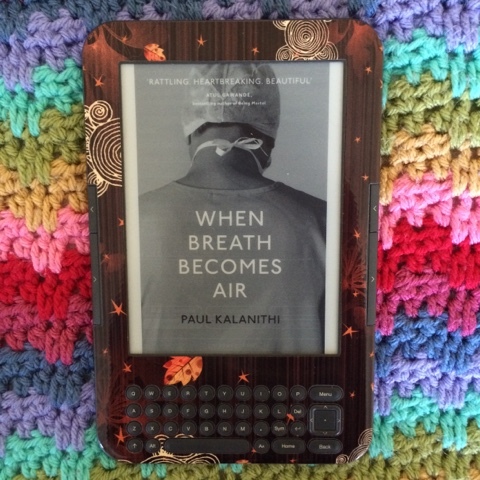 When Breath Becomes Air* by Paul Kalanithi was incredibly emotional. Paul was a very talented neurosurgeon who was diagnosed with cancer - he wrote this book whilst receiving treatment. He writes about being a doctor, being a patient, being a father. I had to admit that the end made me cry, and the section at the end written by his wife made me cry even more. Some sections are very medical and perhaps not for the squeamish, but other than that it's an excellent book I highly recommend. You will need tissues. 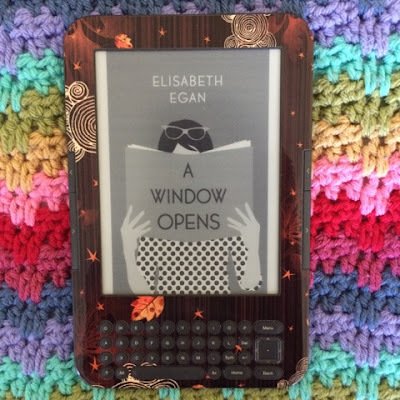 After finishing the above book, I wanted something a bit lighter and flicking through my Kindle I found A Window Opens* by Elisabeth Egan. Wife, mother of three youngish children, starts to work full time, has various family dramas. Sounded like the sort of easy-to-read book I wanted, and would finish in a matter of hours (I had a train journey home coming up that evening) but this book was much better than that. I'm not quite sure why it was much better than I was expecting (perhaps my expectations were quite low?) but this genuinely kept my attention, I didn't skim very much and it's definitely one of the better books I've read recently. Be Frank With Me** by Julia Claiborne Johnson was excellent. M.M. Banning is trying to write her second novel, following her massive bestseller a few decades ago. 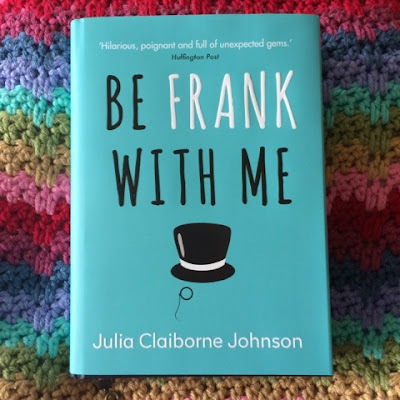 Her publishers send an assistant, Alice, to keep track of her progress and also look after her nine year old son Frank, who is exceptionally clever and dresses like a move star from the 1930s. He has all the well-known traits of being autistic, but this is never stated as such. It's very well written, I really felt for Frank as he tried to navigate the complex world of fourth grade, and also for Alice as she tries to fit in with her job and this rather eccentric family dynamic. For once, it's been a month of excellent reading. Hurrah! *Received from the publishers via NetGalley. **Received direct from the publisher. I can't decide if I want to read HP and the Cursed Child - I'm rereading the HP books at the moment because I want to donate them to the library afterwards, but I'm not sure about this one. Plus, it's a bit too expensive on the Kindle at the moment... I don't even know why I'm unsure about it, I'm not an avid HP fan so maybe that's it. I've heard good things about When Death Becomes Air, but haven't read it myself. Here's to a good August reading month! I really liked When Breath Becomes Air, but made the mistake of reading it on the train from Amsterdam to Brussels and ended up having half a carriage-worth of chic Europeans all looking askance at the sobbing English girl. The afterword by his wife is what did for me.